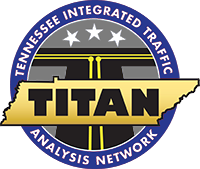 This website is developed and maintained by the THP to serve as a portal into the State of Tennessee’s repository for traffic crash and surveillance reports completed by Tennessee law enforcement agencies. The integrity of the TITAN data is dependent upon both the accuracy and frequency with which the data is updated and user’s interpretation. Therefore, no warranty, either expressed or implied, is given to the accuracy, completeness, reliability, or suitability for any particular purpose of the information contained in TITAN.